Happy First Birthday, my beautiful, sweet daughter. You are a treasure, and I love you so much! February has flown by! I know it's because I've been procrastinating getting everything together for the two birthday parties we have going on this weekend and the next. So many people have told me how convenient it is that my kids' birthdays are two days apart, making one birthday party for both of them a snap. However I am a birthday GIRL, and it would not have gone over well with me if I'd had to share a party with my brother, much as I do love him. Therefore, I can't imagine making my kids share a party, at least not at this stage in the game. So that means over the next 7 days I'll be making two bakery stops, two balloon stops, and two very different party themes happen. I'm tired just thinking about it, but I'm doing it to myself so I'm not asking for sympathy. Jack's birthday will be at Chick-fil-a. I know every mom on Pinterest just gasped in unison at the thought of me not having special customized wraps on his bottled water, but it's his favorite thing in the world, and who am I to deprive him of it? He loves to play on the playground, and I love their diet coke, so really it's a win-win for both of us. Plus I can prolong cleaning up my house for company for the next week when we have Annabelle's party here. I even sprung for the cow to make a special appearance. He's going to have a blast! You may have seen my post here regarding our trip to Cook Children's Urgent Care. They featured that post on the Cook Children's blog We Do it All For Kids. It's a great resource for any parent, not just locals, so check it out. I can't say enough good things about Cook Children's. 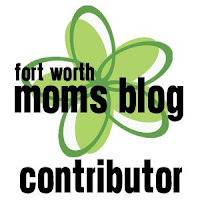 My latest post over at Fort Worth Moms Blog is on new date night dining options in Fort Worth. We tried Cane Rosso late last week, and it was delicious! Nearly every time I make cut out cookies, I use a different recipe. My favorite cookies in Fort Worth are by a bakery called J. Rae's, and I'm always comparing to theirs because they are delicious! The best part is their frosting, which has the perfect amount of almond flavoring in it. But I digress. I make frosted sugar cookies every year for Valentine's Day. I think I've documented them on here every year too. I even had a former co-worker message me last week saying she was missing them. So sweet of her! This year I used a recipe from All Recipes called "The Best Rolled Sugar Cookies." The are delicious. Couldn't get enough of them delicious. Diet was on hold until they were gone delicious. You will notice that the first step is to cream 3 sticks of butter with two cups of sugar, so that's probably the secret duo of ingredients right there. They are decadently sweet, but worth it for a special sweet occasion. I used canned strawberry frosting because I love it. I would put these close to J. Rae's in terms of deliciousness of the actual cookie. Now if I could just figure out their frosting! I'm linking up today with Darci and Company for another Five on Friday! So it's the second month of the year, and you're beginning to wane on that resolution to get in shape, drop the weight, or otherwise just be healthier. What do you do to motivate yourself? You go shopping! New workout clothes always spark new interest for me. What's the fun in buying them if you're not going to wear them out somewhere? Here's what I've had my eye on lately. 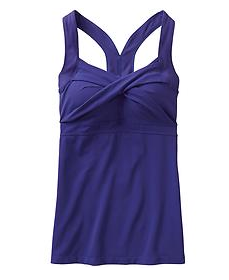 I got the Athleta catalog right after the holidays, and I continue to go back to this tank. It's so flattering! 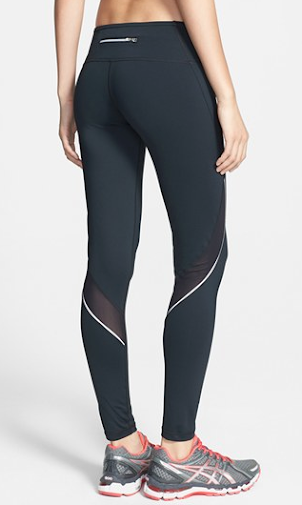 These Hi-Lo Wunder Unders are awesome. You roll the waistband up when you want a little extra holding in, and roll them down on a skinny day. I wish I'd had these postpartum! I think I'm in a blue phase right now. I had a pair of Live in leggings on my Christmas list, and I have truly been living in them. 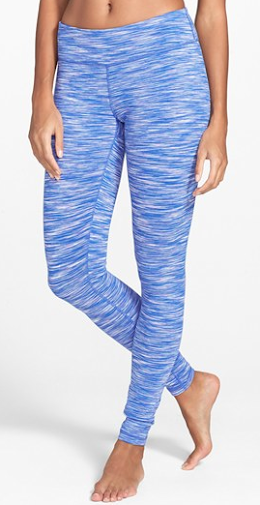 They're a great alternative to Wunder Unders if you don't want to spend quite as much but want a higher quality legging. I have several friends training for the Cowtown, and I had them in mind when I came across these. I'm not a runner, but they might still work for Pure Barre. The zipper on the back might rub during mat work. 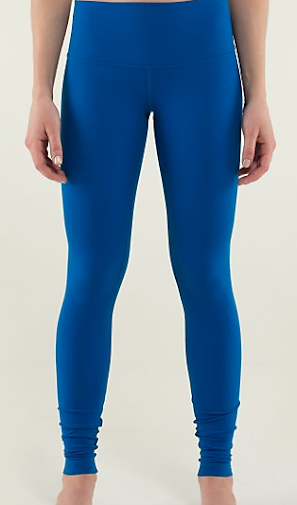 They're so much cuter than plain old black run tights that I had to include them! Scoop Neck Tank in Fresh TealI have a couple of these Scoop Neck Tanks and love this color. A perfect addition for the spring that surely is going to come again. Another very flattering tank. And here's a bonus since I had a hard time keeping it to five. This jacket would be perfect for to and from wherever you're going. It's gorgeous. Some of the links in the post above are “affiliate links.” This means if you click on the link and purchase the item, I will receive an affiliate commission. Regardless, I only recommend products or services I would use personally! Thanks for reading! Earlier this week I got a little bored during naptime, which is code for "I was procrastinating the laundry." 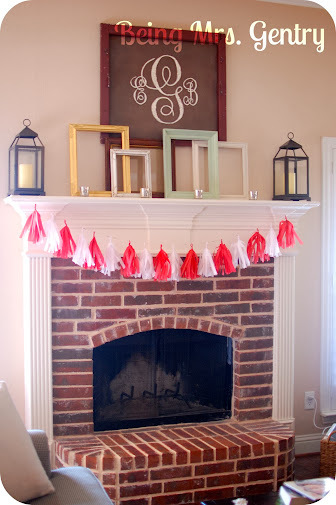 I realized that I didn't have any Valentine decorations up on my mantle so I began feverishly googling an easy idea using stuff I had on hand. Thus I found myself trying my hand at tissue tassels. Now previously this has been kind of a final frontier craft for me. 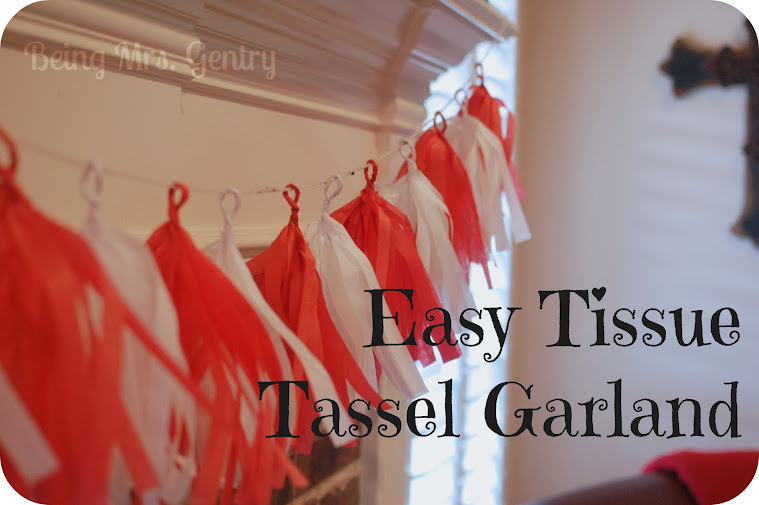 I figured that there was no way I could get tassels looking exactly how I wanted them and would probably tear the tissue paper up in the process. I was only half wrong. The tassels weren't quite how I wanted them, but they were passable, and I did not tear up the paper. At least not the majority of it. I used this tutorial from HGTV, written by The TomKat Studio, which is a really fun party blog, if you've never checked them out before. I posted on Instagram (follow me here!) that this is one of those crafts I would heretofore rather pay someone else to make. Mostly because I couldn't feel my fingertips after from rolling all those little paper tassels up. It felt like I rubbed my fingerprints off. That probably won't stop me though. Those red and white tassels are just begging for some dark blue friends to join them in cheering on our guys and girls in the Olympics starting tomorrow! We're recovering from D-Now weekend over here, but I wanted to jump on the blog for (what I think is) an important Mama Monday. A lot of my local friends read on here (hi friends! 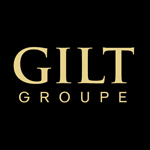 ), so I'd love to let you know about a little gem I discovered this weekend in our community. My kids were packed off Friday evening at suppertime to grandparents for the weekend while Mr. G and I transported students around for the weekend. About 8 PM as things were really getting started in worship, my mom called to say that my oldest (who had been fine two hours earlier) was crying that his ear hurt. By 10:30 she called me back to say that he needed his mommy. By 11:30, I was meeting my dad at a Whataburger in Midlothian, TX in the pitch dark. My little guy could not stop crying about his ear. I've never seen him like that before. 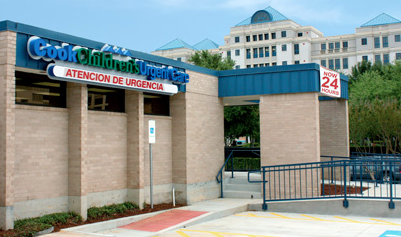 During one of our Cook Children's ER visits, I had spotted a little something called Cook Children's Urgent Care, right across the street. A quick Google search revealed that they were open 24 hours a day, so we headed straight downtown for a middle of the night visit. Within 15 minutes of walking in the door, we were in triage. Within 20 minutes, we had seen an awesome pediatrician, and shortly after, we had some numbing ear drops and a popsicle, all while watching Kung Fu Panda right in our exam room. My little guy showed night and day improvement in a matter of minutes once the drops were administered. Before we left, they dispensed us the drops for pain. A tech stopped by with our dismissal packet that included the diagnosis, after care instructions, a dosing chart based on his weight for common OTC pain meds, list of 24 hour pharmacies in the area, a note in case I had to miss work, and the prescription to drop off. I can't say enough good things about the efficiency of the facility, from the front desk to the exam room. What a blessing to know we have such a wonderful place to turn in the middle of the night when my kids just need some relief. I'm so grateful for the wonderful care we have in our community here in Fort Worth. I thanked everyone we came in contact with for being open all night. Thank you again, Cook Children's!